So you know I’m training to run in the Marine Corps Marathon in October. I will likely be one of the last finishers, because I am such a slow runner, some people think I am moving backwards. But I’m stubborn as they come, so I will (eventually) make it to the finish line. You might not know that I also plan to start competing in triathlons by 2015. (When you are as slow as me, you need to plan these things out in advance.) And my long-long term goal involves outliving all of my competitors so I will – at some point in my 90s – win my age group category. What does any of this have to do with writing, and making the time to write every day? A triathlon involves three stages: a swim, a bike race, then a run. (Distances of each leg vary, depending on the race and how crazy the participants are.) 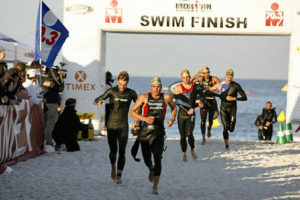 The photo above shows racers emerging from the water. 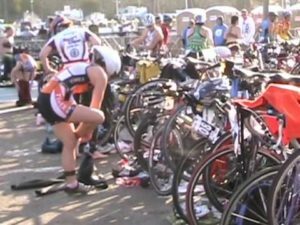 They strip off their wetsuits in the transition area, then get on their bikes and take off pedaling. Transition areas are often filled with thousands of racers. (It can be a real zoo.) After the bike leg of the competition, racers have to properly stow their bike on the rack, take off their helmet, change clothes and shoes, and head out on a long run. Racers prepare and train for smooth transitions just as they train for each of the three events. That same principal comes in handy when you are trying to make daily writing a regular habit. You’re probably pretty good at writing for three or maybe four days in a row, but then life intervenes. The weekend hits. Your in-laws show up. The kids are home on break. Your boss demands you work overtime. The dog gets a stomach flu. Termites eat your walls. The zombie apocalypse begins. Next thing you know, you’ve fallen out of the habit of writing. AGAIN. And you beat yourself up about it. And you find it even harder to start again, because you know that something else will pop up and derail your carefully laid plans. All you need to do is to plan for transitions, those short moments in which you have to shift gears quickly and not lose track of your writing goals. And that’s what today’s prompt will help you do. Ready… Get out your calender and make note of events that are scheduled to occur in the next three months that will likely make it hard for you to squeeze in your daily writing. If shifting gears when the weekend hits regularly creates problems for you, make a note of it. Likewise any upcoming birthdays, or other commitments. Today’s Prompt: You are going to develop your transition strategy for surviving the annoying interruptions to your best-laid plans that life conspires to throw at you. Come up with a list of 15 ideas (Get it? One item for each minute of your writing today – think fast!) that are quick, rewarding, writing-related things you can do when your schedule is unavoidably messed with. These might be related to your Work In Progress, but should not be critical to it. For example, you could map out the town your character lives in. Or brainstorm elements of her backstory. Come up with a list of her favorite songs, or the recipe she wishes her grandfather would teach her to cook. Write out alternative endings for your book, or possible changes to the major decision points. You could write a list of 15 writing ideas that are NOT related to your Work In Progress. Write a poem about the smell of your brother’s feet. Journal about the first dead body you saw. Compose a country and western song about the the dreaded Japanese beetle. The trick is to prepare these lists ahead of time and that the tasks on them are very specific. This ensures that in those few moments you are able to steal when the in-laws show up, or while your beloved partner is beating off the zombies with a chainsaw, you won’t waste any time wondering about what you should be writing, you will actually be writing. I ran into some friends of yours in the elevator and they noticed my backpack from the Kauai Marathon (which I ran last year and I am doing the 1/2 in Sept this year). They told me about your goal to run a Marathon…GO FOR IT! I am running the Nike Women’s SF marathon on Oct 16 this year. I am a training Captain with Team in Training. I have recruited 8 other “moms” to do it with me (here is our web site:http://pages.teamintraining.org/sj/nikesf11/mammajammas). I know we also have one SF/mid Pen team member, Hal, who is doing the same marathon as you. One foot in front of the other, keep moving forward…that is all it takes to finish I always say. I look forward to following your progress. I hear you are up to 17 miles–no problem. Good Luck. You can do it. Will go get my WFMAD before heading to bed…. I am on the south coast of England with my two kids. We are here for my Gran’s 90th birthday tomorrow. I admit, this is the first day in August I’ve written, but I’m making up for it. I wrote today about knowing that you are in the place where you are going to die and dying without your soulmate. Very cheery, but things that have been on my mind a lot. I’ll continue it on my Blog. I need to get back to some project writing. However, I have two large, totally different ideas, and I’m not sure where to start. Hmmmm. Writing has been hard for me the last couple of days, but I have stuck to it and haven’t missed a day yet. Yesterday, as I’m in England and wanted an early night and your post wasn’t up yet, I used one of your prompts from last year to describe how it feels not to be able to write. I did enjoy it despite dreading putting my pen to the page, but I feel I must thank you again for making so many writers get their ideas down even when life is difficult and invasive. Good luck with your marathon running, Laurie – swimming for me is like your running, I should make myself swim more often. Thanks for the prompts. Rather than make a list of other things to write about, I took your advice and adapted it to write lists of events that I think I need to include. I have to say this is suddenly becoming cathartic. I am looking at things closely that have happened and facing them head on..good, bad and ugly. Thank you for your prompting!